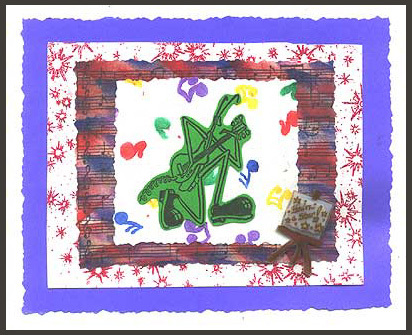 “Musical Notes” is stamped in black on burgundy card stock for the background. 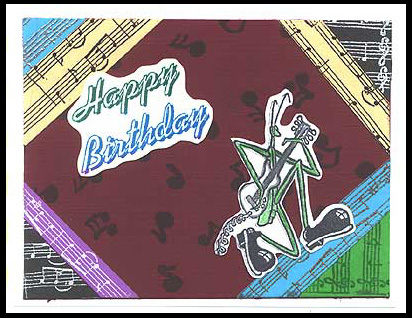 “Musical Notes Background #2” is stamped with various embossing powders on various colors of card stock, cut in different width strips and fitted to the corners of the burgundy card stock in collage fashion. “Happy Birthday” is stamped in a Calypso Kaleidacolor stamp pad on white paper, cut out and glued to the background. “Electric guitar, Lg.” from the Manfred Mantis series is stamped in black Memories, colored, cut out and glued to the background. Card by Davetta Alexander.